When you are just starting out, its not enough to just create amazing content. Sharing it with your few followers on Twitter and Facebook is not a promotion strategy. It doesn’t work like that. If you want to get real traffic and make your blog popular you can’t rely on luck. You need to get influencers that already have a big audience to share your content with their readers. But how do you get Influencers to share your content if you have absolutely zero connections, no reliable reputation and no history of great content? 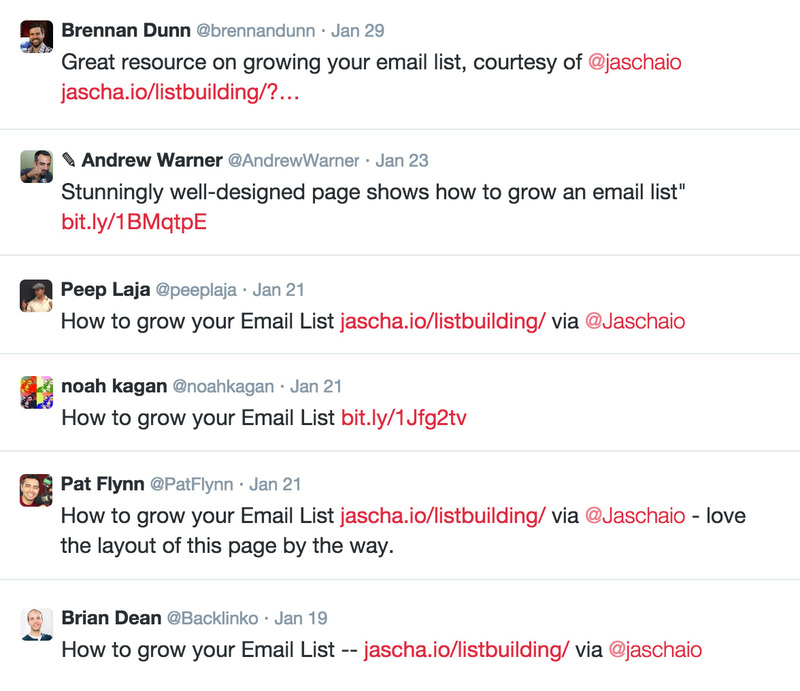 Before I created my first huge piece of content about email list building I knew that. But I had absolutely no idea on how to accomplish it. These famous bloggers get hundreds of emails everyday, from complete strangers asking to do something for free. How can you break through the clutter? Make yourself notice? The point is: Most of the big bloggers are actually humble persons that have no problem in helping out. Because they started some time ago as well at zero – just like us. If you follow along these few simple steps you have pretty great chances that they will notice you. Want proof? Thats actually exactly how I managed to get a few pretty big names out there to share my post with their readers. At the end it comes down to doing the work, overcoming your fear of rejection and making your otreach email all about them. I will show you exactly how to achieve the same results in this post. Exclusive Bonus: Click here to Download my cold Email Checklist along with the exact template I used to share my Content. You got an amazing idea. You leave everything you are currently working on to start working right away. You are motivated and somehow inspired. At least, until you are a few days into the work and then suddenly run out of motivation. Maybe because you have encountered problems you first haven’t thinked off. Maybe because you got distracted by a new idea. Or maybe just because actually doing the work doesn’t feels so exciting like you have dreamed of. So instead of actually shipping the idea you start working on something else, until a new idea cross your mind and everything starts again. We all find these problems, no matter if we are talking about creating, launching or finishing a product, a service, a interesting side proyect or just our next blog posts. We think we have a lack of motivation and get frustrated every single time that we have put things off again. We execute on something until 70% and then fail on delivering the rest that is needed to launch it. And we miss out on all the amazing opportunities that could have been. You will get no Spam and no BS. Just my very best material. Receive weekly strategies. Unsubscribe anytime.